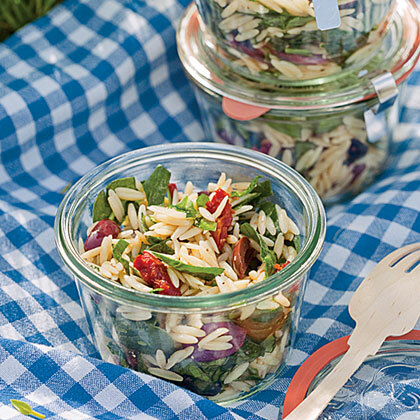 This herb vinaigrette-dressed pasta salad keeps better than a mayo-based one from the deli–and tastes better too. Cook orzo according to package directions. Meanwhile, in a large bowl, whisk together oil, vinegar, oregano, basil, 1/2 tsp. salt, and the pepper and reserve. Drain pasta, rinse with water until cool, and drain again. Add to bowl with dressing and gently mix in spinach, tomatoes, and olives to combine. Add more salt if you like. Keeps: Up to 2 hours at room temperature, 4 hours with ice packs.